Base Board, Whatever you want to call them, they are the board that goes on the bottom of the Hive. Above the stand and below the bottom Brood chamber/super. I have Bottom Boards built in a myriad of ways, each of those ways entirely dependent on the wood I had available at the time I made them. Some use 3/4 boards for all pieces. Some use 3/4 plywood for the platform and 3/4 boards for the sides with routed slots for the base board to fit into and 45 degree corners. 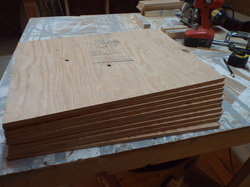 THE most cost efficient way I have found to build them if NOT using scrounged boards, is to cut 1/2 inch plywood to 16 1/4" by 22" Cut 3/4 by 3/4 boards for the hive body to sit on. For the bottom side... it is entirely up to you. 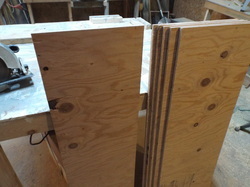 Commercial bottom boards have 3/4 by 5/16 edges so it can be flipped over for a smaller entrance some use for wintering. 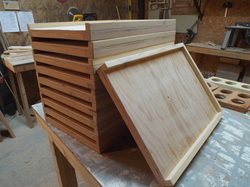 The left over piece is 14 inches I will use it for another swarm box or for Nuc covers. With the cost of the boards I ripped down to 3/4 for the top and bottom rails I have about $3.00 each in these bottom boards. Of course, that doesn't include time, Glue, nails, electricity, saw blades, the fuel to go get the boards, etc.. But still way cheaper than buying them. Ten more ready for paint! I use entrance reducers, and or Mouse guards and have no intention of flipping them over. So I use pieces of 2x cut to 3/4 inch thickness. It adds strength and stiffness. Basically, you build them with what you have, or HOW you like to build them best. So long as they are the right width and there is a 3/4" shim on the top side so your feeders and entrance reducers fit correctly, the rest is entirely up to you! I have boards built as seen above three years old and still holding up very well. When they do begin to fail, I will let you all know how long they lasted! A good link to a description, uses and construction of a screened bottom board. The Link to the place you can buy the one pictured. You can buy them through Mann lake, Brushy mountain etc etc.. There are many places to find instructions for use and building screened bottom boards. I don't use them. Perhaps they would be of benefit, but the winds here are seldom gentler than 8 - 10 MPH, and OFTEN reach 30 MPH. During storms any time of the year those winds can exceed 50 mph, and that without a nearby tornado. I have spoken with folks who live in a similar climate that claim they do well wide open year round, and I have spoken with others who claim they lost more hives when they used them. Like many things in beekeeping they are controversial. YOU are the one who needs to decide to try the screened bottom boards or not. I am getting along well without them, so see no need to use them at this time. If that changes, I will update and state my reasons.